By this point, the ongoing dispute between Edge Games and Mobigame regarding the "Edge" trademark requires little introduction. As has been extensively reported, French indie developer Mobigame developed a game they called Edge and released that game as an iPhone app in the iTunes store. Edge Games, owners of the "Edge" trademark, objected to Mobigame's use of said trademark and took several actions, up to and including petitioning Apple to remove the game from the iTunes store and engaging in a lengthy discussion with Mobigame over the possibility of resolving the trademark conflict. Apple, for their part, pulled the app from the iTunes store. 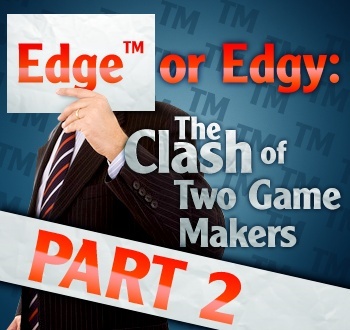 Mobigame, however, refused to accept Edge's trademark claim which touched off a debate that has raged ever since. Two weeks ago The Escapist printed a story regarding this debate. Three The Escapist editors spent a week poring over documents provided by both parties in the dispute and consulting with copyright attorneys to determine who, if anyone, was in the right regarding this case. The documents supporting Mobigame's position, some of which had to be translated from French into English at our expense, were sent to us directly by Mr. David Papazian, CEO of Mobigame. The documents provided by Edge Games, however, were taken from the Edge Games website, although The Escapist did receive numerous answers to email questions from a person who, after much prodding, finally revealed themselves to be Dr. Tim Langdell, CEO of Edge. The initial conclusion we reached from our research and reporting was that, although both parties in the dispute may have acted in incomprehensible and unjustifiable ways, Edge Games' legal claim to the "Edge" trademark seemed sound. A copyright attorney we reached for comment who saw these initial materials stated that, were he advising Mobigame in the matter, he would have recommended they settle. As such, our article called Mobigame's behavior in so aggressively disputing the trademark, rather than settling the matter, "puzzling." Nevertheless, Mr. Papazian has remained firm in his conviction that Edge Games' trademark is unsound, and has pledged to continue to fight. Mr. Papazian and others have repeatedly contacted The Escapist asking that we reverse our position, but in the absence of any further evidence contradicting our initial conclusions, we were content to let our analysis of the matter stand and remain firm in our previous reporting. That is, until recently.